SAULT STE. MARIE — Season number 53 of Laker hockey is ready to commence. The Lake Superior State Lakers will begin their fifth season under head coach Damon Whitten on October 7th, as they travel to North Andover, Massachusetts to face the Merrimack Warriors. The 2017-18 Lakers finished 10-22-4 overall, and 8-17-3 in conference play, losing out on the final playoff spot on the last day of the regular season. Lake Superior hopes to return to the Western Collegiate Hockey Association (WCHA) playoff picture. Before the season gets underway, a quick look at the roster is in order. 21 players return to the squad. Joining them are eight newcomers all of whom are freshmen. Four members (one forward and three defensemen) were lost to graduation and two (one forward and one defenseman) did not return. As we did in our season wrapup back in the spring, both of us are putting our own thoughts on each position as we go along. Dennis: Of the eight freshmen, five are forwards, including local standout Ashton Calder. Also new to the team is Pierre-Luc Veillette, Miroslav Mucha, Melvin Karlsson & Owen Guy. There is one thing this whole class has, and that is scoring ability. Each one of these guys were either above, or just below, the point-a-game mark. This is huge, although Karlsson, coming from Sweden, would’ve played on the larger ice surface so let’s hope his game transitions well onto the North American sheet. In addition to the freshmen, we have plenty of returning firepower, including captain Diego Cuglietta and speedster Max Humitz (who had a team high 13 goals last year). The rest of the stable also look solid, but personally I am excited to see what Yuki Miura will do with a full season under his belt, as he was hindered by injury and NCAA clearing issues for most of last season, along with relative newcomer Alex Ambrosio who really impressed me when he came in after the holiday break. Mike: Cuglietta, along with Gage Torrel, will be co-captains this season and fellow senior Anthony Nellis will don an A as an alternate captain. All three have been productive throughout their time in Sault Ste. Marie and are poised for big years as seniors. While Torrel did seem snakebitten last season, he still had 16 points, good for 6th on the team. The three seniors all saw their production go down a bit in 2017 — Torrel’s was just the most noticeable. In addition to J.T. Henke, who graduated, the Lakers will also not see Jake Hand return. Early last season, it looked as though the Torontonian was going to break out. While he did have a career high 12 points, much of his production came early in the year as he was unable to keep his success going. There are eight upperclassmen forwards on this squad, which the Lakers haven’t seen in many years. The majority of them have been major point producers in their time here (each has at least two double digit point seasons), but the likes of Bryan Basilico, Ian Johnston and Brendan McKay have struggled to get on the score sheet. Basilico had four points in 2017-18, which was the most for any of the three in their first two seasons. Good play can be contagious, however, so maybe if the rest of the offense can be productive, it can rub off on these guys too. Mike: On the blueline, Lake Superior lost four defensemen, all of whom saw significant time in their Laker careers. Captain Aidan Wright, assistant captain Ryan Renz and three-time recipient of the team’s Most Valuable Defenseman award Kyle Chatham, all graduated last spring. Throw in Matt McArdle, who will be playing as a graduate transfer at Merrimack, and the Lakers have lost a group that logged many minutes on the back end. Sophomores Tyler Anderson and Will Reidell saw plenty of action in their rookie season. While it was apparent that they were fresh to the college level, they showed flashes of promise. It awaits to be seen how they will develop. Dennis: This is the most worrisome part. We lost some very solid players. It’s hard to gauge defensemen using websites like Elite Prospects, since it doesn’t show time on ice, but I feel comfortable saying that Mitchell Oliver, an incoming freshman, will be picking up a lot of that slack. Oliver, in 54 games as the captain of the Alberni Valley Bulldogs of the BCHL logged an impressive 39 points while also earning 64 penalty minutes. In the playoffs, he had six points in seven games. But also returning are juniors Collin Saccoman and Steven Ruggerio, along with sophomore Lukas Kälble. Saccoman and Kälble both were hurt on the Denver trip last season, which crippled the team, and Ruggerio, an Anaheim Ducks draft pick (2015, #178 overall) , was dealing with his own injuries while sitting out for half the year due to him transferring from Providence. When these three guys were healthy though, the team changed completely. We also didn’t see much of Bennet Vida last season, outside of some of the exhibition games, where he looked solid, but apparently needed some more time to develop. Even with these returning players, along with the incoming players, I’m nervous about injuries, and who we have to step into those roles. I’m hoping whomever the odd-men out are really stepped up their game in the offseason. Dennis: There isn’t much to say here. We return all three of our goalies (Roman Bengert did not play last season). There are some questions going into the season though. The Kossoff/Mitens tandem was shakey to say the least last season, but each showed flashes of brilliance. Nick really needs to return to his freshman form. Mareks’ goaltending style seems to be really flashy, which can be fun to watch, but if he doesn’t get that puck, he seems to find himself on the ice, scrambling to get back up. Honestly, I don’t care if that’s the case as long he can recover quickly and not let in soft goals. But with Roman seemingly ready to go this season, having a third goalie push the starting two, whomever they may be. Competition is a good thing. Mike: The only time we’ve seen Bengert in any kind of action was during last year’s Blue vs Gold game. In that game, he had very little to do, as most of the action was in the other end in his period of play. While we did see more goalie changes than usual last season, I don’t believe we can fully fault the guys between the pipes. When they could see the shots, they were stopping them most of the time. Kossoff had a save percentage of .911 while Mitens was at .897. Often times, coaches use pulling a goaltender as a move to try and energize the team. It’s also worth noting that Kossoff played the game of his life in Denver last season, making 63 saves on 66 shots and setting a school record in the process. Mike: Damon Whitten, as mentioned, is back for his fifth season behind the Laker bench. In his first four seasons, he has compiled a record of 43-80-18. The Brighton, Michigan native signed a four year extension during the off season, meaning expectations are high that Whitten will be able to turn the team around. Also returning is assistant coach Mike York, who will be in his second season with the Lakers. Perhaps the most notable news to affect the Lakers over the summer was the departure of assistant coach Rich Metro. A Sault native, Metro accepted an offer to coach the boys U-16 team at Shattuck-St. Mary’s in Faribault, Minnesota. One of the most prestigious prep schools in the nation, SSM gains Metro after spending eight years (in two stints) behind the bench at Lake Superior. Replacing Metro is a Zach Cisek (pronounced SIZE-ick). A graduate of Michigan State, Cisek spent a couple of seasons at Miami University as a graduate assistant before moving on to Notre Dame. A former goaltender, he worked closely with their goaltenders, including Cale Morris, who went on to win the Mike Richter Award as the top collegiate goaltender. Dennis: While this isn’t the place to debate coach Whitten’s extension, I think that will be a sort of cloud hanging over his head heading into the season. I also don’t have much to add concerning Mike York or Zach Cisek. I do hope that Coach York will continue to impress upon the players, namely forwards, what it takes to be successful on the ice, seeing as he played in 579 NHL games. Also to note, Zach Cisek helped Notre Dame to a Frozen Four appearance last season, ultimately losing to winners Minnesota-Duluth. But the loss of Rich Metro is the biggest news going into the season. We’ve heard all sorts of rumors about how the coaching staff got along, but Rich always felt like he was kind of the emotional core of the staff, never seemed to have a bad thing to say about anybody and would spin even the worst trait into something to look forward to – that’s something that’s hard to replicate. But these things should serve him well at Shattuck. Schedule: Following with the four year pattern the WCHA appears to be following with its scheduling, the Lakers will essentially play a similar slate to their 2016-17 campaign. The five squads they played four times that season (Ferris State, Minnesota State, Alabama Huntsville, Northern Michigan and Alaska) will be seen four times this year. Michigan Tech and Bemidji State play the Lakers twice in Sault Ste. Marie, while Alaska Anchorage and Bowling Green will host Lake Superior in their only meetings of the season. As per usual, Ferris State will be the final opponent of the regular season. Unlike last season, the games will be at the Taffy Abel Arena, meaning the home slate will not end in January this year. The non-conference schedule is a mixed bag; Lake Superior will host Michigan, travel to Merrimack, and play Michigan State and either Michigan Tech or Michigan again at the Great Lakes Invitational (GLI). 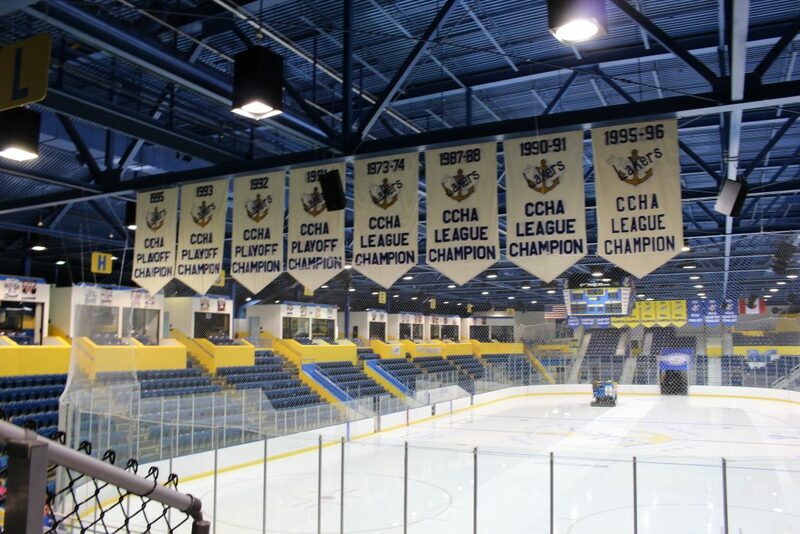 Michigan returns to the Soo for the first time since the dissolution of the Central Collegiate Hockey Association (CCHA). As mentioned, the Lakers will open their season against Merrimack — only the second Hockey East school (after Vermont) that Lake Superior has faced since Whitten became head coach. This series is full of intrigue, as former Lakers head coach Scott Borek was named bench boss of the Warriors in May. Finally, the Lakers will be making a return to the GLI in Detroit for the first time since 1999. The GLI has been held annually since 1965 and has traditionally involved Michigan Tech, Michigan, Michigan State and a fourth team chosen at-large. This will be the Lakers fourth appearance. They finished 3rd in 1977, 2nd in 1996 and 4th in 1999. Mike: On paper, there are many things to look at that both give hope and cause concern. The question marks on the blue line and the comparatively down years of some players on the forward unit do raise some concerns. On the flipside, the goaltending showed last season that it could keep the team in a game. And while some of the big point producers of years past had down years in 2017-18, the law of averages says they should be able to bounce back this year. Unlike in previous seasons, the Lakers looked better after Christmas than before. Maybe it was the team jelling, maybe it was the presence of Ruggiero, Miura and Ambrosio in the lineup. Nobody can argue February was a bad month with four straight road wins. On paper, the team should be able to build off that late season push and put the rest of the WCHA on notice. On paper. In practice…that awaits to be seen. Dennis: A number of fans have been asking how I think the team will do this year, and my standard reply is thus: On paper, I think this team has the skill to shock not only the league, but the NCAA at large. With these powerhouse freshman forwards coming in, along with some leadership on the back end, the Lakers are poised to make their games a high scoring affair. However, there is one big unknown stopping me from getting too excited: the coaching staff. I had a paragraph set up talking about why, but I think summarizing it up with Coach Whitten’s overall record of 43-90-18 over his first four years tells the story here. Lake States’ new Athletic Director David Paitson must have seen something in Whitten to give him a four year extension with that record, and he does have a bit of hockey operations experience, so like most of last season, I’m willing to give the benefit of the doubt here, but the extension does have many fans worried, so the team will have to have continual success throughout the season, not just a hot streak at the start and end of the season like we experienced last year.